The Stone Boatmen (Aqueduct Press, 2014) is a tale of three cities, separated by oceans, lost to one another long ago: the first, the city of rituals, of ceremonies; the second, the city of words, of poetry; and the third, the city of the golden birds, of dreams. In their harbors stand the stone boatmen, pointing outward toward the unknown. Now the birds are fostering a new-found relationship of the three cities of the ancestors, and the voyages of the ship Aphelion and its crew are beginning to rebuild the links. Certain imaginative novels never best-sell, yet remain alive, a singular treasure to each new generation that finds them—books such as Islandia, The Worm Ouroboros, Gormenghast. The Stone Boatmen has the makings of one of these quiet classics. It is lucid yet complex. Its strangeness fascinates, captivates. To read it is to find yourself in a country a long, long way from home, taken on a unforeseeable journey—and when it’s over, you wish you were still there. The voyages of the ship Aphelion reconnect three isolated cities whose shared past is an enigma of half-understood relics and myth. Tolmie gently guides the reader through a winding thread of linked relationships that span decades as each generation rediscovers infatuation, love and hate, grief, and joy; what could be mere grand inhuman spectacles of epic historical processes are firmly rooted in individual friendships, romances, and bitter feuds that add a vital human dimension. Tolmie’s prose is addictive, ‘a feast of words burning bright against the dark,’ drawing the reader into the subtle tale. Intimacy is favored over flashy action, contemplation over bold speeches. This unique little gem eludes comparison to other works, and discerning readers will count themselves lucky to discover it. 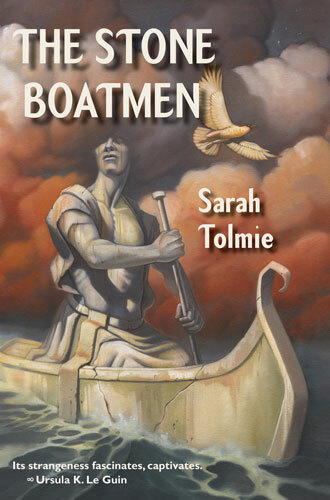 In Sarah Tolmie’s The Stone Boatmen […], two kingdoms separated by ocean have been left with giant statues by a common ancestor of whom they have no record. The first kingdom is united by rituals that have lost their meaning for many of the inhabitants. But then Prince Nerel, who uncannily resembles the statues, meets Azul, his own double. Their friendship—bound by their physical likeness to each other and the 15 giant boatmen that sit in their bay—inspires the country to discover kin across the sea. Azul’s son voyages to a kingdom governed by a deeply spiritual belief in the power of words and poetry. What follows is a series of interpolated tales that weave more mystery around the common ancestor of all these people. In Tolmie’s novel, writing becomes a holy act, temple birds carry an ancient grief, and statues that never move are eerily alive. You will want to find such places once you’ve finished reading this remarkable novel. A lab technician’s “death” and metamorphosis serves as the prolog to The Stone Boatmen, a powerfully original first novel by Sarah Tolmie. After that glimpse of a techie Ancestor, she takes us to a city dominated by its rites: for fishermen, courtesans, and princelings alike. Prince Nerel muses, “Only after one had run up against the same ceremony time after time, molding oneself to all its parts, could one know it entirely or express its full shape. A ceremony was a slow means of gaining knowledge.” Frustration with the pace leads him to start looking outside the court, compiling “The Book of the New Ceremonies” from humbler material. He also has the capacity for a more direct, yet mystical, form of experience, where thoughts and feelings join in an almost overwhelming jumble of everything-at-once: a Great State that others experience both here and elsewhere in this month’s reading, wherever journeys involve multiple dimensions of mind and body, space and time. Physical objects, relics like the gigantic statues known as the Stone Boatmen, inspire a more active type of explorer to get a move on. Though both Prince Nerel and his ritual doppelganger Azul bear a striking resemblance to the Boatmen, only Azul can suggest potential uses for Instruments left in a palace museum. Azul’s son Mahar (“not content just to see”) gets his own “message direct from the ancestors…. This is the way to go.” He sets off on an ocean voyage that will restore the connections between three Silverlink Cities, each with its own preoccupations: ceremonies, names and language, and the holy mysteries of birds. Over several generations in these fragments of a lost world, Tolmie’s characters don’t follow the standard emotional or intellectual trajectories of genre fiction. Self-doubts keep some of them alert and restless. A poet becomes midwife to royal twins, while her own child (product of an encounter that never truly blossomed into mutual romance) would rather be a dancer than string together words. When probing minds make progress, they reconceive what seemed to be the most urgent questions. At any moment, beauty may strike with random grace, and unpretentious little details evoke the sense of wonder. Reading The Stone Boatmen feels as natural as breathing, but you can’t take anything for granted. The narrative itself is a complex structure—unsurprising perhaps given that weaving plays a significant role in one portion of the novel—but it never overwhelms the story’s unfolding. The reader is never forced to admire the “cleverness” of the storytelling. Instead, one has a great sense of the harmonious interaction of the story’s disparate parts. The narrative is never less than utterly compelling and absorbing yet it mostly eschews high drama for a steady, even recounting of the story. It is in so many ways the complete antithesis of modern fantasy writing, a novel that deals with the intellectual problems of a world rather than battles or magic. Which suggests to me that one way to read The Stone Boatmen is as an allegorical questioning of the assumptions that underlie so much modern genre writing. It is a nourishing sort of book, the kind of novel where you want to make notes as you go, because it raises so many interesting points. It is also a book that develops with each subsequent reading. I’ve now read it three times and I’m still finding more to think about.